It would have to include a lot of bands. diverse sampling of local talent. Achievement House. Maybe It’ll Grow Back does a songby Pinkeye. and we all enjoy the fascinating re-interpretations. 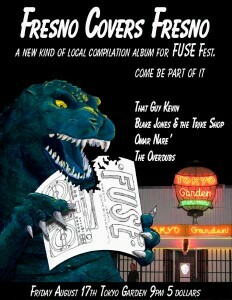 Have the project done by mid-2013—ready to promote FUSE Festival #6. Selected recordings will be pressed up on a CD. All submissions will be available online for download. All profits will support the FUSE Festival. The first one is Friday, August 17. Come out to support.